In a difficult race at a rain-lashed Aintree, the Ferraris once again crushed the opposition with a clean sweep at the British Grand Prix. Wolfgang von Trips emerged victorious, with Phil Hill and Richie Ginther behind him; reigning world champion Jack Brabham finished fourth, his best result in what turned out to be a wretched campaign, in which he only scored one other point. Such was Ferrari's dominance that it left Liverpool with the constructors' championship already secured with three of the eight rounds remaining. A wet track and high winds prevented any fast times in practice, but Phil Hill did enough to take pole, with team-mate Ginther alongside him on the front row. In the early stages of the race it was the familiar trio of Hill, von Trips and Ginther at the front ahead of Stirling Moss, Jo Bonnier and Jim Clark. Cementing his reputation as a masterful driver in the wet, Moss harried the Ferraris until he overtook Ginther on the sixth lap. Four laps later he caught Hill and moved into second, much to the delight of the 100,000 crowd. Moss then went after von Trips, gaining on him lap by lap until there were only yards between them. Meanwhile, behind the leaders the conditions took their toll as a succession of cars spun and skidded out of the race. Henry Taylor lost control of his Lotus coming out of Melling Crossing and crashed into an advertising hoarding, pinning him inside his car. It took a long time to release him from the wreckage before he could be taken to hospital. 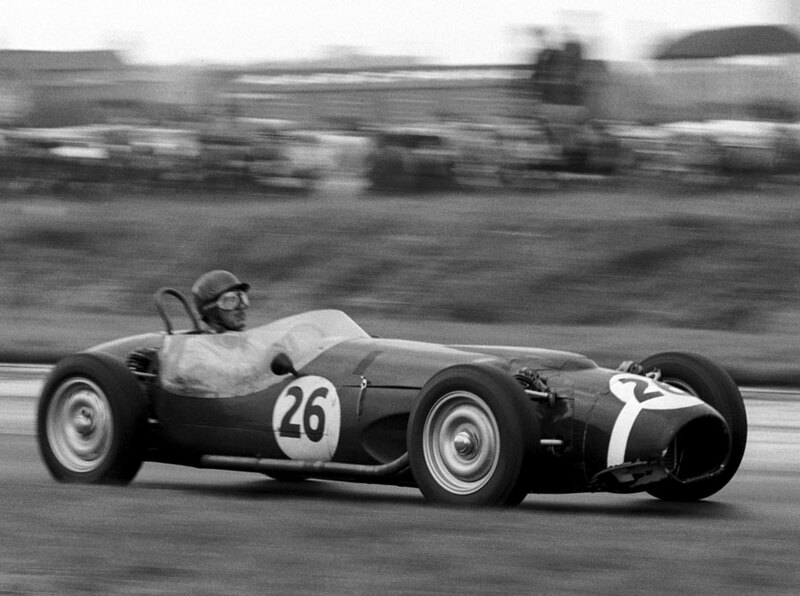 Moss, although his vision was hampered by the spray coming off the leading Ferrari, tried to pass von Trips between Melling Crossing and Tatts corner. He hit a sheet of water and aquaplaned, nearly spinning off the track. Although he regained control, he had lost vital seconds and a few laps later his heroic drive was ended by a broken brake pipe. By this time the rain had stopped and weak sunshine began to dry the track, giving the Ferraris even more of an advantage. They quickened the pace, increasing their lead over the rest of the field, but the management weren't happy with the race order. They held out a sign saying "Trip-Hill-Gint" and Ginther dutifully slowed down to let Hill through into second, ensuring Hill gained crucial world championship points. Von Trips held on to the lead and took a very damp chequered flag to claim his second grand prix win and Ferrari's fourth in a row, putting him top of the world championship standings on 27 points, two points ahead of Phil Hill. Tragically, it was to be his last victory, as he was killed in Monza two races later. It also proved to be Moss's last grand prix on home soil as his career was ended by an accident in a minor race the following April.